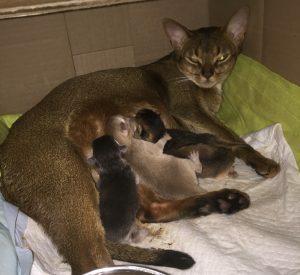 Yesterday on the 5th of December, Nala gave birth to four beautiful kittens. 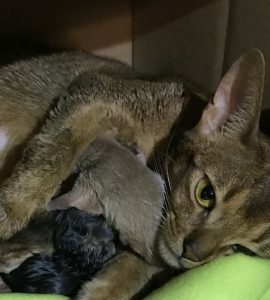 She went into labour at 5 PM and 10 minutes later the first kitten was born! After another 10 minutes, the second kitten arrived. The third one came at 5:45, and the fourth one at 6:27! So far, everything has been going well and Nala has proven to be a wonderful mom ❤ Kittens seem fine, but it is still early days, so let’s hope that they keep eating, sleeping and growing. The first couple of days are always critical and we will keep a very close eye on Nala and her kittens to make sure that everyone is happy and healthy. ? Blue male, fawn male, ruddy girl AND ruddy girl. Tired but very happy mommy. Kære Stina, Agnetha, Sebbe og ikke mindst Nala. Stort tillykke med et dejligt kuld og 2 vildtfarvede piger, Super. Glæder mig til at følge dem.